Running two laps around the 1.56 mile reservoir, the men's team beat Boston College, 31-24, while the women's team fell, 50-15. However, since the meet occured before the NCAA qualifying window, the results will not have an impact on either team's standing for the season. For the Crimson men’s team, senior Louis Colson and junior Collin Price took the race’s top two times, beating all of Boston College with matching 15:54.5 times. For Colson, Friday’s victory marks his first career win in cross country. As runner up, Price also recorded his best collegiate finish. On the women’s side, all of the competing Harvard runners ran together, led by captain Elianna Shwayder, a U.S. Track & Field and Cross Country Coaches Association All-Region honoree, and finished as a cohesive group with a time of 11:16. Freshman Abbe Goldstein, sophomore Gillian Meeks, freshman Tessa Medrano, senior Fiona Davis, and freshman Anna Juul all competed for the Crimson. "The BC meet was fairly relaxed, but our group of girls ran together and looked strong. We've had some quality training during our pre-season time back on campus,” said Junior Malia Ellington. “We are excited for our season, especially the meets at our home course, Franklin Park." 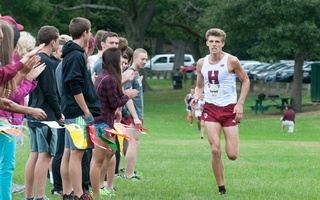 Looking ahead, the Harvard cross country teams will officially kick off the season in New Haven on Sept. 15th. The Crimson will travel to compete in the annual Harvard-Yale-Princeton meet hosted this year by the Bulldogs on the Course at Yale. Last fall, the Harvard women’s team won the 2016 Ivy League Heptagonal Championship. This season, three of its top five scorers return to compete for the Crimson, prepared to continue leaving their mark on the collegiate running scene. Senior Courtney Smith and sophomore Judy Pendergast will both be running in the Pac-12 Conference this season for Stanford and Oregon, respectively, after transferring. Last season, Shwayder, in addition to being named to the USTFCCCA All-Region team, was apick for the All-Ivy League second team, placing 12th at the Ivy League Heptagonal Cross Country Championships and finishing eighth at the Harvard-Yale-Princeton meet. She will be a key runner for the team once again this year. Other top scorers to look out for this season include junior Erin Dietz, who finished fifth at Heps a season ago and was named All-Ivy League first team, as well as sophomore Lisa Tertsch, who is expected to build on her strong freshman campaign, during which she placed ninth at Heps and was named All-Ivy League second team. For the men, junior co-captain Kieran Tuntivate, who crossed the finish line at Heps in 18th place and was also named a USTFCCCA All-Region select, is expected to lead the team both on and off the course. Another key returner for the Crimson is sophomore Will Battershill, who looks to continue building on his standout freshman campaign last spring in which he finished third at the IC4A/ECAC Championships in the 3,000-meter steeplechase. The Harvard women’s team enters the 2017 season ranked No. 25 in the USTFCCCA National Coaches' Poll, and No. 2 in the USTFCCCA Northeast Regional Rankings. Harvard is the highest ranked Ivy League Team, followed by the Yale women’s team, which currently holds the No. 30 spot. Cross Country coach Bill McCurdy, known as a master of understatement, calls his present squad "a strong and experienced team." ​Led by an individual victory by junior Courtney Smith and top-10 performances by three freshman, the Harvard women’s cross country team took home its first Ivy League Heptagonal Championship since 1985. This historic victory was Harvard’s seventh overall title in program history and Smith’s title is Harvard’s first since Suzanne Jones took home gold in 1989.